It folds onto a specific trike dolly cart for set up and storage in under 10 minutes. What's Different on the REV X? You asked for it ….. We listened! Like the ultralight Rev – full suspension, no front strut and quick fold in under 10 minutes make this a great off field trike that can be transported easily by one person. BUT, when the wind blows the fun doesn’t stop with the RevX. Brute force in a small package. The REV X uses a 25% smaller wing, a longer and wider wheel base and nearly double the horsepower of the ultralight version the Rev. The 12m Rascal wing, commonly found on the RevoLT, has been reengineered to a 750lb gross (150lb greater than the ultralight Rev wing). Like the 2 place Rascal, this wing has a full set of turbulators (VG’s) for incredible short field take offs and landings. The small 28ft spanned wing no longer floats like a leaf but cuts through turbulence like a large 2 place trike. Light control forces combined with quick roll rate make this package extremely fun to fly. The legendary Rotax 582 powers this performance trike. This motor is coupled with the E-gearbox with electric start turning a 4 blade E-Props as standard. This capability means cross-country flights are a reality thanks in part to the larger 10 gallon fuel tank. A hydraulic parking brake allows you to secure the aircraft when you reach your destination. The fuel system is upgraded to long lasting aeroquip lines with auxiliary electric fuel pump and CNC gascolator as standard. Float style fuel level sender monitors the fuel level closely. 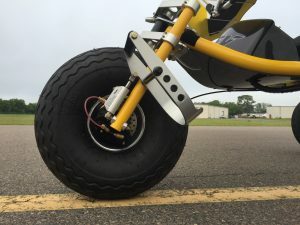 An even stronger landing gear with larger 5/8in axles on a longer, wider wheelbase increase durability and stability in rough terrain. All this power, weight and speed classify the REV X as an N numbered aircraft (in the USA) which requires a license to fly. Fellow Trikers, you must fly the RevX. 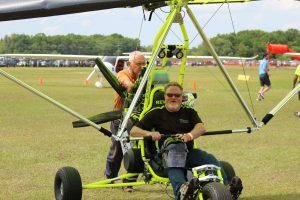 I have flown many brands, sizes, and types of trikes but I have never flown anything more well behaved and easy to fly before. Takeoff in a few seconds, climb over 1200 fpm, cruise at a comfortable 40 – 45 mph. Roll pressure light and with the small single surface 12 meter wing it handles turbulence with ease. Can fly a fun single seater not just in the am or evening but all day long. Crosswinds definitely not a problem. Stall easy to detect and not surprises. Large flare window for easy landings. Great suspension, but my landings on it were sooo easy I never tested the suspension travel! Anyone that wants to build time on a super fast set up and take down (realistic 6 minutes) trike and not limit flying to mornings and evenings must give this RevX a try. My face is still hurting from smiling after flying this wonderful machine. Solid, stable, comfortable, easy, nimble, and exhilarating are words that come to mind. 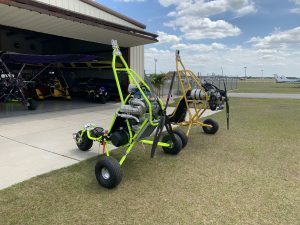 Thank you for your innovation on this new machine that is built with the same quality and materials as your 2019 Grand Champion Light Sport Revolt. Thank you for trusting me with your new machine and everyone, when you get the chance try it you will love it! Truly nothing out there in this class or category. The suspension comes from 4 "flex rods". The entire front end is a swing arm giving the nose wheel equal travel. The entire front end disconnects and "unplugs" to fold the trike in lieu of a folding mast. In its folded form the rear wheels lift off the ground creating a counterbalance effect making the wing effortless to bring up and down. 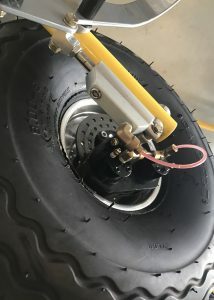 Real STOL Aircraft brakes with dual calipers and 4 brake pads!